POWERFUL ANDROID FIELD TABLETWhether you’re collecting data, crunching numbers or viewing graphics, the Algiz RT7’s powerful Qualcomm quad-core processor provides reliable, uninterrupted work performance. And the Algiz RT7 doesn’t just run Android flawlessly — its capacitive touchscreen also enhances the Android experience with five-point multi-touch capability, 600-nit high-brightness sunlight readability and chemically strengthened glass. TOUGH, RUGGED, EASY TO CARRYThe Algiz RT7’s physical design balances full ruggedness and lightweight ergonomics — without compromising either. Algiz RT7 was designed from the inside out to be comfortable to hold and easy to carry, resulting in a tablet that weighs just 650 grams. 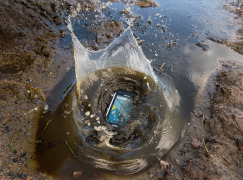 Yet the Algiz RT7 also meets stringent MIL-STD-810G military standards for withstanding extreme temperatures, drops and vibrations, and its IP65 rating means it’s waterproof and fully protected against sand and dust.